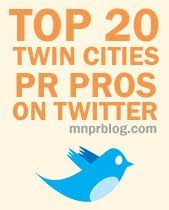 The Minnesota chapter of the Public Relations Society of America (PRSA) celebrated the outstanding public relations campaigns of 2012 during the 35th annual Minnesota PRSA Classics Awards, held last night at The Metropolitan Ballroom in Golden Valley, Minn. The awards banquet, emceed by Heidi Collins, FOX 9 anchor, and Brant Skogrand, APR, Minnesota PRSA immediate past president and PRSA Midwest District chair, was attended by more than 260 public relations and communications professionals from area agencies, corporations, nonprofits, government and freelance sectors. In addition to honoring the top public relations campaigns, David L. Schoeneck, APR, president of The Praxis Group, was honored with the Donald G. Padilla Distinguished Practitioner Award and Christina Milanowski, social media director and account supervisor at Maccabee Public Relations, received the Young Professional Award. The Classics Awards are divided into two categories: Elements and Programs. Elements Awards honor the best program tactics and Programs Awards honor the best overall public relations campaigns. The highest scoring entries in the Programs Awards category are eligible for the top honor of the evening – Best of Show. This year’s Best of Show award was presented to the Minnesota National Guard and Interagency Employment Working Group for its efforts behind the “Hire Minnesota’s Veterans” campaign. After increasing levels of unemployment among post-9/11 veterans, the Minnesota National Guard organized “Hire Minnesota’s Veterans” to help today’s veterans translate and polish their skills and link them with employers. Through this program, the Guard initiated the military-focused Interagency Employment Working Group and created a three-step process for veterans and employers that consolidated existing programs and bridged gaps with new resources. As a result of the campaign, unemployment among a pilot unit with the 1st Brigade Combat Team dropped from 19 percent to 1.3 percent. The campaign earned more than 20 million media impressions about veteran employment and the benefits of hiring veterans.